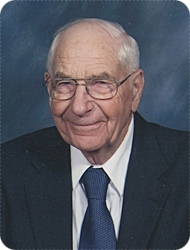 William Burton Cushman, age 92, of Alto, went to be with his Lord on Monday, November 12, 2018. Bill proudly served his country in the Korean War. He was preceded in death by his grandson, Jeremy; sister, Winnifred Cushman; and brother, Robert Cushman. He will be lovingly remembered by his wife of 63 years, Arda; his children, Rebecca (Ron) Spitzer, John (Sara) Cushman, Peter (Wendy) Cushman, Jane (Pat) Horner; 15 grandchildren; and four great grandchildren. The family will greet visitors on Wednesday, November 14, from 4 - 7 pm at Stroo Funeral Home, and Thursday, November 15, from 10 - 11 am at Alaska Baptist Church, 7240 68th St. SE, where the funeral service will begin at 11 am with Rev. Brian Harrison officiating. Interment will be in Bowne Center Cemetery. Memorial contributions may be made to Lincoln Lake Baptist Camp or Alaska Baptist Church Mission Fund. Arda, May you know our Lord's comfort during this hard time.